A sub ohm tank for the ages. The Horizon Tech Falcon was designed to deliver award worthy flavor without sacrificing your cloud. Dollar for dollar this sub ohm tank earns your loyalty and appreciation by deliverign a flavor experience that is incomparable by anything else we've tested with pre-built coils. At 25.2mm this tank will fit just about every mod you own and sit atop it like a crown on a king. Flavor has never been this easily accessible and you'll be all the better a vaper for it. 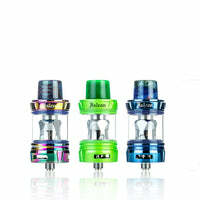 Horizon Tech Falcon Sub Ohm Tank - Horizon has a rating of 5.0 stars based on 22 reviews.